A virtual DJ software mixing console for playing and crossfading mp3 and wav files. supports VDJ, M3U, PLS playlists, and automatically crossfades the songs. Powerful virtual DJ mixer software for you ! Virtual DJ Software - Virtual DJ Studio is an virtual DJ Mixer and MP3 Mixer for live DJ performances. With it, you can Mix MP3 Files, use multiple Sound Cards, and adjust Pitch and Tempo on each file individually. 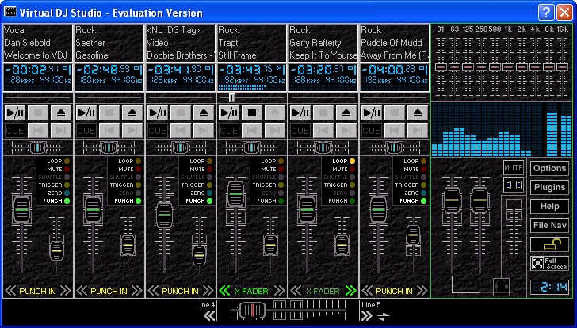 Virtual DJ Software also contains a full 10-band Graphic Equalizer, full support for Audio Plugins, a Spectrum Analyzer, and many more tools for DJs. Virtual DJ Software - Virtual DJ Studio is unlike any other virtual DJ software or MP3 DJ Mixer. It allows you to have several Music Files loaded up and ready to go. It has an integrated ID3 Tag Editor and Playlist Editor, and many other unique features that allow you to Mix MP3s like a Pro. Filled DJ Software --- Virtual DJ Studio is not like all of the other DJ software out there. While other DJ software limit you to two players with a Cross-Fader, Virtual DJ Studio provides you with an entire studio. Click on the image to your right to see a full-sized picture of Virtual DJ in action. You will quickly see how VDJ is different from other DJ software. Laid out like a Mixer, each Line features a full MP3, WAV and Playlist player, with its own Volume Fader, Pitch/Tempo control, and more. You can select how many Lines appear on VDJs interface. You can configure as many lines as will fit on your screen. Easy to Use --- Don't be intimidated by the number of buttons you see in the picture. If you have a knack for audio equipment, you will quickly pick up on VDJs use. VDJ comes with a complete Help file, including a Getting Started guide that will have you mixing MP3s in no time! File Navigator --- VDJ3's File Navigator gives you a whole new way to locate your music. It functions as a file manager, displaying all supported file types along with extra information (bitrate, sample frequency, bit resolution, etc). The File Navigator lets you preview any file without having to open it. File Navigator also contains an integrated Playlist Editor, for building and managine PLS, M3U or VDJ playlist files. Improved Drag 'N Drop Support --- You can drag files from the File Navigator, File Queue, or any other Windows program (such as Windows Exporer or your Desktop). You can also drag files from any line in VDJ to another line, or into the File Queue (or even to other programs). VDJ3 gives you limitless possibilities with Drag 'N Drop, allowing you to intuitively open and manage files. Headphone Support --- VDJ allows you to use an extra sound card for CUEing, or Previewing, a sound file. You can use this feature to assist with beat-mixing (fading two songs together on-beat), or for simply previewing a song before playing it live. Plugin Support --- VDJ3 now offers Plugin support. Third parties can contribute audio processing plugins that can be used within VDJ3's Plugin Manager. VDJ3 comes with a few Plugins as well, including a Compressor/Limiter, a Low-Pass Filter, and Stereo Expansion. EZ-DJ Plus - A DJ Mixer Software, DJ with your MP3s, Mix, scratch and cross-fade your MP3s just like a club DJ! WMA MP3 Converter - convert bwteen audio formats WMA and MP3. CD DVD Label Maker - make DVD or CD labels maker software. DVD X Player - perfect region free DVD palyer and VCD CD Mpeg4 all computer movie player. It provide superior quality video and audio also others:e.g. optional skins, playback image and DVD, image capture and bookmark, etc. and supports DIVX Mpeg4 RM QuickTime WMV WMV-HD Flash SWF and so on, super movie player for you!